Discover how Beyond Software can help your organization increase project profitability. What will these short product demo videos show you? 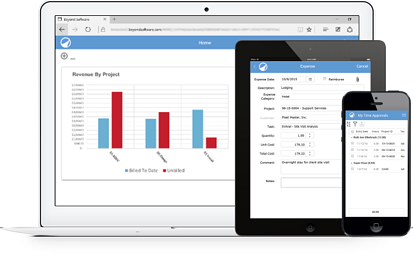 Capturing & recording your time and expenses has never been easier. The Beyond Software mobile app gives you 24/7 access from any device, anywhere. Beyond Software makes it easy for you to streamline your billing process with flexible billing rate setup options and detailed invoice formats to fit your needs. "Beyond Software is feature rich and flexible. We are able to efficiently manage a large number of projects, sub-contractors and expense reports. The reporting and consoles make analyzing our data much easier and they provide our organization with actionable business intelligence. Beyond Software is a powerful professional services automation solution that I would recommend to any project focused business." - John Penezic, Sam Brown Inc.